The Iziko Slave Lodge hosts a display of Egyptian artefacts within the Iziko collection. The collection of Egyptian artefacts, however, span greater than what can be viewed in the upper level of the Iziko Slave Lodge. Traditionally, Egypt has always been separated from the rest of Africa and grouped with other ancient civilisations such as Greece, Rome and the surrounding Eastern Mediterranean Sea cultures. Early historians and Egyptologists reasoned that non-African populations formed the roots of the Egyptian civilisation. Egypt is, in fact, a culture that developed on the continent of Africa. The Egyptian civilisation and history is thus part of Africa’s peoples, history and culture. The ancient Egyptian civilisation evolved, in particular, around the Nile River and its environs. In the process the Egyptians established a truly brilliant civilisation on the continent of Africa where their influence spread far beyond the borders of their country. The Egyptian influence and heritage can be traced down to South Africa where Egyptologists had connections, artifacts were dispersed and everyday and religious/grave objects can be found in our museums. 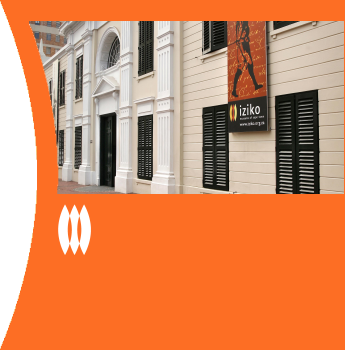 One such museum is the Iziko Slave Lodge situated at the foot of the Company's Garden in Cape Town. Egypt has had a historical as well as mythical attraction for travellers, historians, archaeologists and scientists alike. From its geographic location, religion and gods, clothing and adornments, written language, burial customs and architecture the country has managed to capture the hearts of thousands of individuals and research institutions. A mural of the North wall of Tutankhamun's tomb painted in the Egyptian room of the Iziko Slave Lodge. Images are from the Egyptian Collection found in the Iziko Slave Lodge and Photo Archives of Iziko. Maps and images marked MACU were supplied by the Department of Ancient Studies, University of Stellenbosch. Special thanks to Anlen Boshoff, ex-curator of antiquities at Iziko, Esther Esmyol, curator at Iziko, and the Department of Ancient Studies, University of Stellenbosch.